The temperature has soared outside so most of us are probably heading to the fridge to get a cool beverage or a cold ice cream, but what if that fridge became sentient, turned angry and devised a plan to wipe out all ice cream plants using a blimp army. You'd probably think that wouldn't happen, but that has happened in Narwhal's ZX Spectrum game ' BLIMPGEDDON ', and it's down to you as Agent 99 to put a stop to Hans Von Deck, the first sentient fridge. 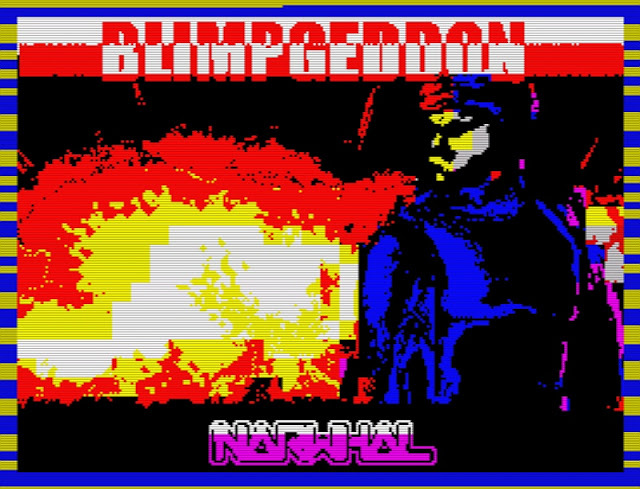 BLIMPGEDDON does have one of the weirdest stories we've read for a long time, it's not often a fridge comes to life and you have to stop them. But when it comes to the game itself although I really do like the different game play styles from swimming under water to working out how to get past that next baddie as a platformer, it did have a few down sides. Firstly there's no music and secondly there are times in the game where you can get a bit stuck. For example in one scene I was pushed up and I couldn't come back down again where I needed to be, and yet what I thought was a lever sticking out, turned out to be a mine and I lost my lives. Still that's about the only niggles I had with the game, as other than that it was rather enjoyable... If just a bit tough!